This document provides information on the application of EMAT Technology used to detect corrosion in pipe systems. 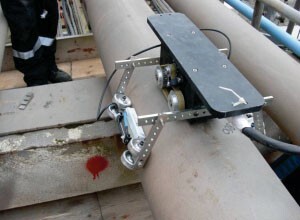 The technique provides high speed non-destructive material analysis via ultrasonic guided wave inspection of the complete circumference and volume of the tubular material. It provides qualitative not quantitative information on the severity of the corrosion. EMAT transducers are a hybrid device that uses electromagnetic fields to generate and receive ultrasonic waves. It therefore gains many of the advantages of electromagnetic inspection, such as the ability to be used on irregular surfaces, as well as the advantages of ultrasonic testing, such as the ability to detect corrosion. The EMAT probes generate a guided ultrasonic wave in the pipe that travels in the circumferential direction. This wave is sensitive to corrosion losses on both the ID and the OD of the pipe, and travels between the transmitting and the receiving EMAT transducer. On-line inspection capability up to 250F with neodymium iron boron magnets (NdFeB) and 500 F with Samarium Cobalt magnets (SmCo).